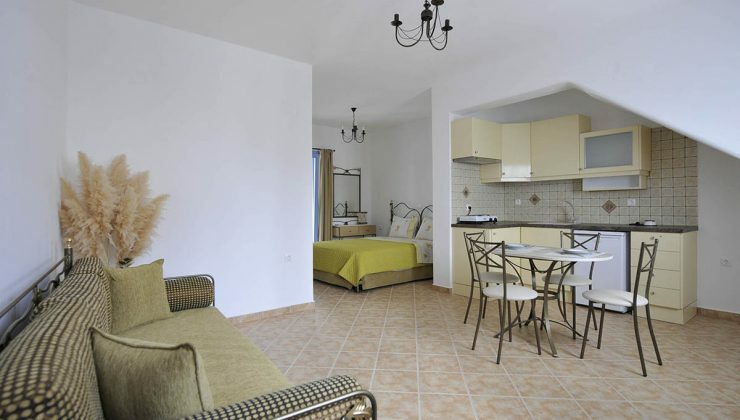 Evita Apartments are the perfect choice for your Greek island holiday. Six rental apartments, all can accommodate 2 – 4 persons, with living/kitchen area, separate bedroom and spacious bathroom. All the apartments have a balcony or veranda with seaview, flat screen TV’s with NOVA satellite service & WiFi internet. 15 metres from the sandy beach of Aliki, and 50 metres from the village centre. Apartment with semi-separate bedroom, living area & kitchen.